I Want to be Super! I Want to Be Super! was written by Chelsa Bingham for a college assignment in a Language Arts for Elementary Teachers class at Weber State University in Ogden, Utah. 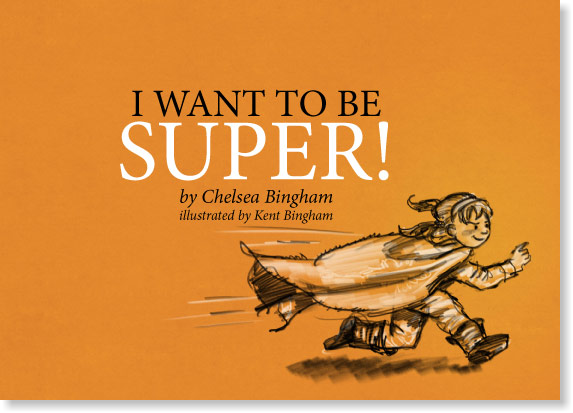 It is Chelsea's first experience writing children's literature and Kent Bingham's first time illustrating a children's book. In Kent's words: "I always thought that someday I would illustrate a children's book, but didn't foresee having less than 24 hours to accomplish it. To meet such an extreme deadline, I had to forego my perfectionist tendencies and work quickly in a rough sketch style." Read it online here or buy the printed version at Amazon.com.